To remain efficient and effective, PTS is slowly transitioning to the use of registered license plates to verify permit status. 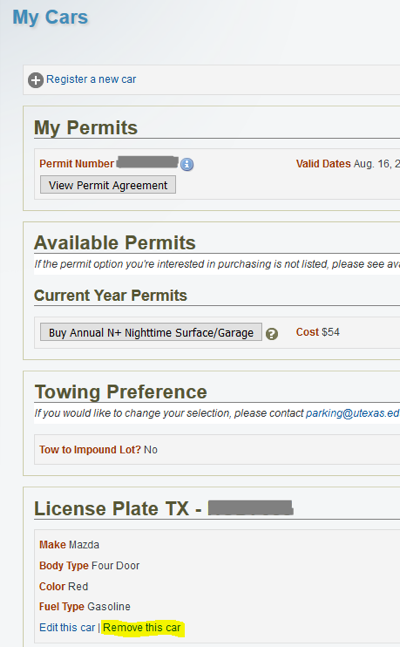 Permits will continue to be utilized, but the license plates of vehicles you use will be checked for parking eligibility. We request that you review your license plate information by 5 pm on Thursday, December 21, 2017. Beginning on Tuesday, January 2, 2018, we will start utilizing our current license plate recognition (LPR) technology to better manage daily parking in the garages. 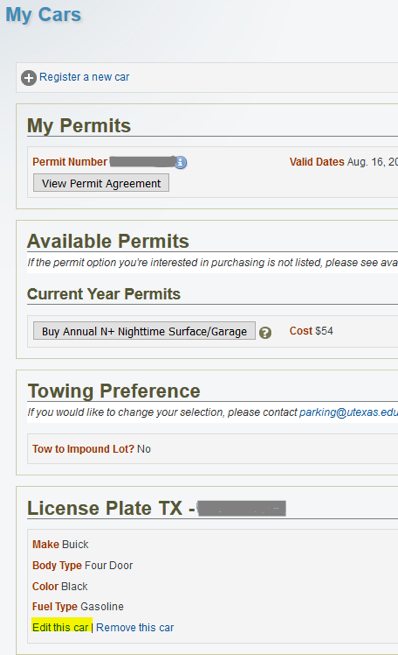 You may register as many as three vehicles, but note only one registered plate can be parked on campus at any given time. Please update any incorrect or missing information. 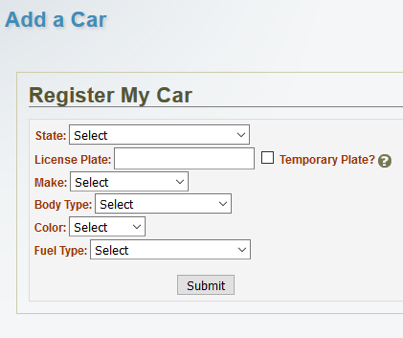 We do request that you register temporary license plates. Once the actual plate arrives, add the new plate and then remove the temporary plate. Those parking in the garages are being transitioned to this system immediately so please take the time to check your license plate registrations and update them as necessary. Failure to register your plate may result in citations. 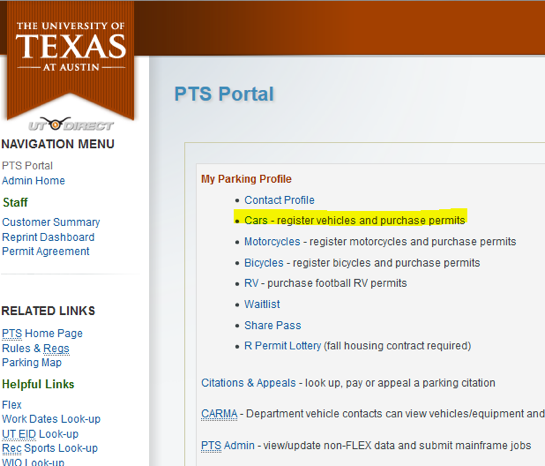 You can review and update your registered vehicle information here: https://utdirect.utexas.edu/apps/pts/parking/car/logon/. At the top of the "My Cars" page, select "Register a new car"
It is important that you complete all of the entries on the "Add a Car" page and click on "Submit"
You will be directed back to the "My Cars" page and your car will be listed at the bottom of the page. 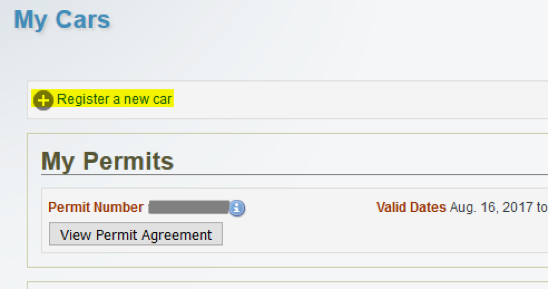 Scroll down to the car that you want to delete on the "My Cars" page, select "Remove this car"; a confirmation prompt will pop up asking if you're sure that you want to remove this vehicle - click on "OK"
Scroll down to the car that you want to edit on the "My Cars" page, select "Edit this car". Make your changes and click "Submit". License plates may not be updated. Instead, please register as a new vehicle with the new license plate. Then remove the vehicle with the old plate.